This incalmo bowl is made from 7 separate sections. 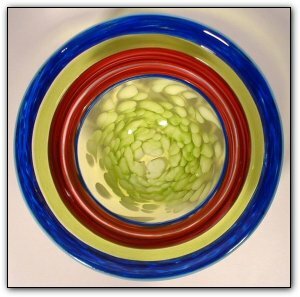 Incalmo is an extremely complex technique where each section is made separately and then they are joined one at a time while the glass is still hot. From the outside going towards the center, the colors begin with a beautiful baby blue lipwrap which is followed by a section each of blue, yellow, pink, white, pink again, blue again, and then the center is a luscious pattern of many shades of yellow.